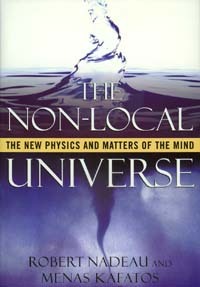 The Non-Local Universe: The New Physics and Matters of the Mind by Robert Nadeau and Menas Kafatos, Oxford University Press, Oxford, 1999; 240 pages, ISBN 0-19-513254-6, hardcover, $27.50. that "even if experiments could somehow be conducted in which the distance between the detectors was halfway across the known universe, the results would indicate that interaction or communication between the photons would be instantaneous," that is, that the foundation of physical reality is actually "non-local" — a discovery the authors view as "the most momentous in the history of science." Without troubling of a star.